Cornelius Place, a combination of library and multifamily housing, is on track for occupancy in February. Forty-four apartment units are slated to open next month in Cornelius, providing a lower-cost living option for people age 55 and older. The apartments at Cornelius Place are designated for seniors in households making 60 percent or less of area median income, with some units set aside for those making significantly less than that. "It's an incredibly specialized way of doing housing," said Destin Ferdun, project manager at Cornelius Place for apartment developer BRIDGE Housing. BRIDGE Housing is a San Francisco-based nonprofit provider of low-income and senior housing. In the case of Cornelius Place, it's both. The senior apartments in Cornelius are a rare addition to the "affordable housing" supply west of Dairy Creek, coming online the year after three market-rate apartment complexes opened in neighboring Forest Grove. In fact, Ryan Wells, Cornelius' community development director, believes Cornelius Place to be the single largest affordable housing development ever built in Cornelius. But there's something else that makes Cornelius Place virtually unique. 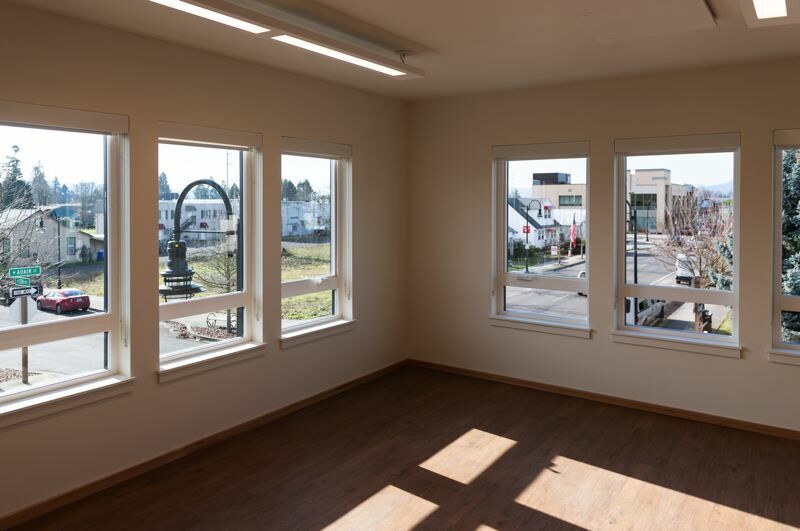 The senior apartments occupy the second and third stories of a building that will also house the Cornelius Public Library, slated to move across the block next month from a much smaller building it shares with city offices. Library director Karen Hill said she knows of just two other libraries that share their buildings with senior living. The City of Chicago made headlines in 2016 when it unveiled plans for three public library branches sharing a location with affordable housing — but even by then, Cornelius' own plans were well underway. In 2013, city voters narrowly rejected a bond measure to build a new library in Cornelius. 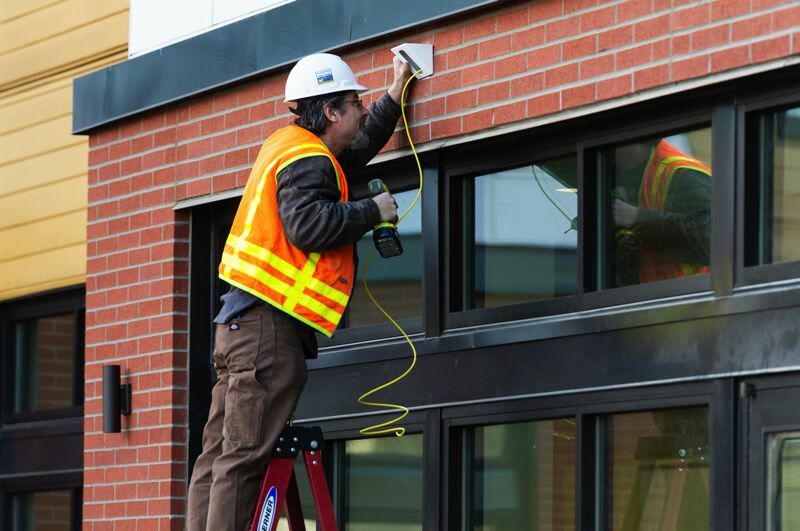 Hill and other library backers went back to the drawing board, ultimately finding a willing partner in Hillsboro-based Bienestar Oregon for a combination library-housing project. As the project progressed, Bienestar pulled out, handing over the role of affordable housing provider to BRIDGE Housing, although it remains a "special limited partner" in Cornelius Place, Ferdun said. Splitting the building means splitting the bill. "We've shared all the costs," Hill said. "Everything they've paid two-thirds of, and we've paid one-third of. And that's how we were able to afford it, of course." BRIDGE Housing has also received federal and state affordable housing credits, Ferdun noted. With federal, state and local governments helping to foot the bill for Cornelius Place, the nonprofit has been able to add 44 apartments — plus one for the on-site property manager — to Cornelius for significantly less than it would have cost to build them on its own. 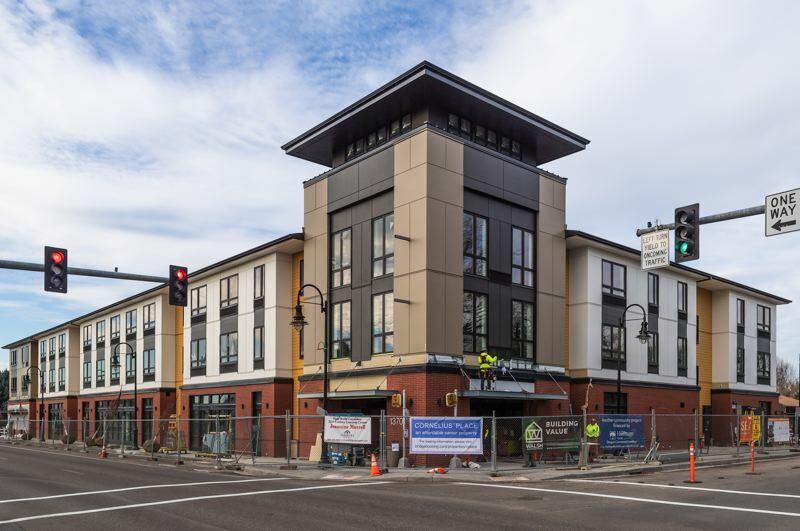 It's not lost on Ferdun, and it's certainly not lost on city officials, that the three-story building at the corner of North Adair Street and 14th Avenue stands out. Cornelius Place is the latest adornment to the Highway 8 corridor through town, joining Virginia Garcia Memorial Health Center, another imposing, two-story building on Adair Street that opened in 2012. "The idea is to get this public investment to show what could be possible to market-rate developers and investors and businesses," Ferdun said. "It's just been (a) totally symbiotic relationship, and it's been great," said Hill. Ferdun and Hill hope that combining the library and apartments will have benefits beyond the purely financial. "We're hoping that some of those folks will be interested in volunteering for us," Hill said. "We're excited that the library has got lots of volunteer activities that we're hoping the seniors will take advantage of," Ferdun said, naming after-school reading programs and study support for students at Cornelius Elementary School, located just across 14th Avenue, among them. The current library space is just 3,000 square feet, very small for a community of Cornelius' size. The new library space on the ground floor of Cornelius Place totals nearly 14,000 square feet. "We are going to be doing a lot more programs for adults … one, because we have more space, but two, because we have this built-in audience," Hill said. To that end, the library has just hired an adult services librarian, Hill added. She is scheduled to start work Thursday, Jan. 24. Cornelius Place is not an assisted living facility. Each apartment has a kitchen area; there is no community dining hall or commons. The library itself, however, could help meet residents' social needs, Ferdun suggested. "It's one of the major synergies," Ferdun said. "There is the catalyst development for the new downtown, and there's the sharing of the costs in order to make the project go. But probably the most important for both the library and us is the social aspect of being able to get the seniors and the library interacting — to prolong and give them a good, healthy life, as well as the kids that they might serve." Units range from 218 square feet to 904 square feet in area, according to Ferdun. Rents start at $678 for a studio apartment and range up to $780 for a two-bedroom unit. All units are individually vented and have their own thermostat for heating and air conditioning, allowing each resident to set the ambient temperature for their apartment. A parking area on the north side of the building is shared between the library and apartments. Street parking is plentiful along Adair and Baseline streets and in the surrounding blocks. 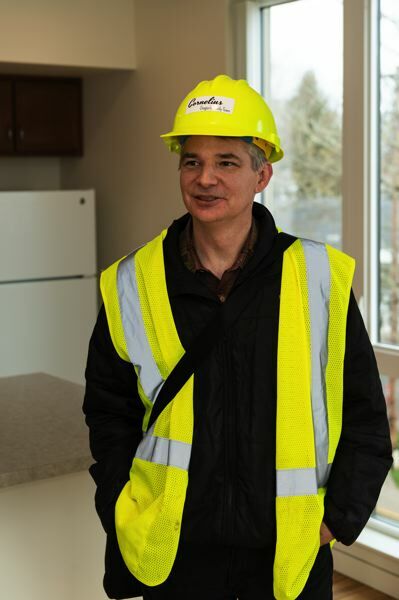 BRIDGE Housing hopes to obtain a temporary occupancy permit for the apartments this week, Ferdun said. It is targeting mid-February for move-in. Hill said a "soft opening" for the new library is tentatively scheduled for Feb. 25. A grand opening ceremony for the building is planned for March 30. Editor's note: A previous version of this story misstated the number of floors the Virginia Garcia Memorial Health Center in Cornelius has. It is a two-story building with a taller northeast corner facade. The story has been corrected.